A parliamentary report of 1777 recorded local workhouses in operation at Brampton (for up to 25 inmates), Castle Carwicke (9), Cumwhitton (7), Nether Denton (21), Farlam (30), Hayton (7), and Leonard Coast—Askerton Quarter (20). 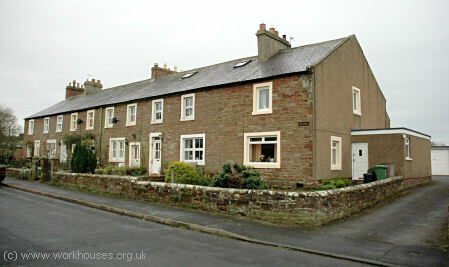 Brampton had a parish workhouse at the south of the town on Gelt Road. 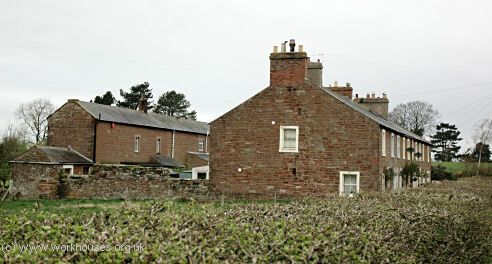 Brampton former parish workhouse from the north-east, 2005. Hayton's parish workhouse was situated at Acres, half a mile from the village, where it was built in 1826 on ground given by TH Graham. A small poorhouse operated in the village of Milton in West Farlam. Cumberland: Askerton; Brampton (4); Burtholm, and part of Banks; Castlecarrock [Castle Carrock]; Cumrew; Cumwhitton, Northsceugh, and Moorthwaite; Nether Denton; Upper Denton; East and West Farlam (2); Hayton, Fenton, Faugh, Little Corby, and Talkin (2); Irthington, Newby, Laversdale, and Newtown (2); Kingwater; High and Low Walton; Waterhead. Later Additions (all from 1861): Carlatton, Geltsdale, Midgeholme. The population falling within the Union at the 1831 census had been 10,080 — with its parishes ranging in size from Upper Denton (population 106) to Brampton itself (3,345). The average annual poor-rate expenditure for the period 1834-36 had been £2,384 or 4s.9d. per head of the population. The first Brampton Union workhouse was the existing parish workhouse on Gelt Road. It comprised two parallel blocks — a larger one nearer to the road with a smaller one to its rear. Its location and layout can be seen on the 1860s map below. Brampton's first union workhouse from the south-east, 2005. In 1875, a new and much larger workhouse was erected on a two-acre site at the north of the town, at the north side of what became Union Lane. Its design was the subject of a competition and the winning entry was by the team of Charles S and Alline J Nelson of Leeds and Derby, who were also the architects of workhouses for the Bramley and Wharfedale Unions. The location and layout of the new Brampton workhouse can be seen on the 1899 OS map. At the south of the site fronting onto the road was an entrance block with a central entrance archway. To the rear was a T-shaped corridor-plan main building. At the north of the site was an infirmary and isolation block. The building cost a total of £15,000 and could accommodate 200 inmates. The 1875 workhouse has now been completely demolished. The old parish workhouse has now been converted to residential use. 1914 — Master: John N Duerdin; Matron: Emma Duerdin. Carlisle Archive Centre, Lady Gillford's House, Petteril Bank Road, Carlisle CA1 3AJ. Holdings include: Guardians' minutes (1837-1930); Accounts (1837-1939); Relief order books (1848-94); Vaccination lists (1871-1928); etc.